This portable device combines the latest in GPS, AHRS, Data Recording and ADS-B technology to bring pilots a progressive backup solution thats both Android and iOS compatible. An internal WAAS enabled GPS and AHRS provide all navigation information necessary to turn your tablet into a glass panel. The Dual Band ADS-B (978/1090MHz) receiver allows you to monitor free inflight weather, METARS, in addition to traffic information. This unit brings aviators unparalleled safety and redundancy within the cockpit. 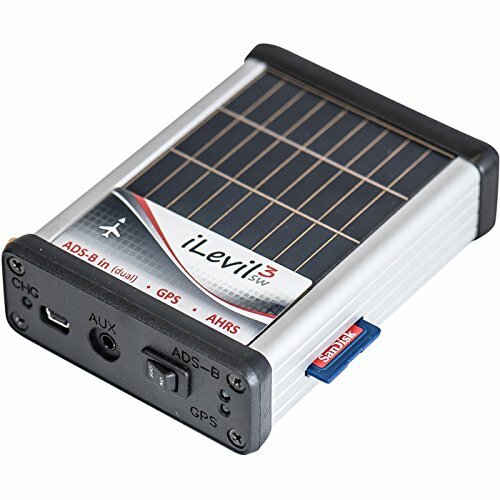 Up to 10 devices can be connected to this system, and it's compatible with multiple mobile platforms, allowing pilots to choose from a wide range of Apps and devices.FeaturesWAAS GPS (antenna inside)Roll, Pitch, Magnetic Heading, Rate of Turn, Inclination, and G-meter data outputWiFi Access Point (enables +10 devices connected to the same iLevil)978/1090 MHz ADS-B receiver for free in-flight weather and trafficIntegrated solar panels recharge the batteries over time or extend the standard 5hour battery to 6 hours on a bright sunny day.3-axis gyros, accelerometers and magnetometers professionally calibrated for aviation-grade performance. Watch VIDEOMicro-USB communication for remote firmware updates, data transfer and battery charging.Automatic ON/OFF operation through 3.5 mm audio jack using regulated 5VIN/OUT serial communication (allows data transfer to/from other hardware inside the cockpit, i.e. Zaon traffic, panel mounted EFIS displays)Operating temperature: -10° to 60° C (14°-140° F)Everything integrated in a small package: 3.2" x 4.2" x 1.1"
If you have any questions about this product by Levil, contact us by completing and submitting the form below. If you are looking for a specif part number, please include it with your message.